Once a century, one person is chosen for greatness. And it was not Alodia. Alodia is the crown princess of the realm. The sister who knows how to rule, and the one who is constantly reminded that she has not been marked for a grand destiny. But Alodia has plans, and she will be the greatest queen her people have ever known. So she travels–with her hopeless, naïve, chosen sister–to a distant part of their land, to begin to secure her supporters. This region needs its princesses, for it is plagued with a curse. The crops don’t grow, the spring doesn’t arrive, and a fierce jaguar stalks the shadows, leaving only empty homes splashed with blood behind. If Alodia can save them, no one will be able to deny her strength and her sovereignty. But what she discovers could change the fate of her kingdom, if not her world. And it will most certainly change her opinion of her younger sister. 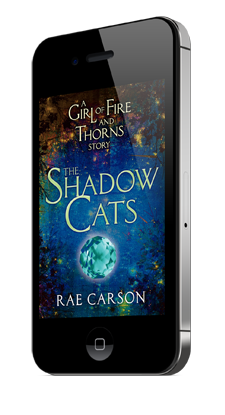 “The Shadow Cats” is a prequel to the riveting Fire and Thorns trilogy: Book One, The Girl of Fire and Thorns; Book Two, The Crown of Embers; and Book Three, The Bitter Kingdom. It’s no secret that I love Rae Carson and her books, but I’ve had this novella since the day it was released and have been consciously ignoring it until now. Why? Well, because as much as I love Rae, I’m not the biggest fan of Alodia, Elisa’s sister. In the first novel because she just seemed cold, distant and calculating – a wholly political animal. In The Crown of Embers… well… well, she just needs to Back. The. Heck. Up. Hands off, sister. (If you’ve read it, you’ll understand.) So, to reiterate: not wearing “Alodia’s #1 Fan!” t-shirts over here. Yeah, I really should have had more faith in Rae and in her ability to consistently blow me away. Taking place before The Girl of Fire and Thorns and narrated by Alodia, the princess is traveling with her royal contingent and younger sister Elisa to one of Oravalle’s border territories to attend the wedding of the Conde Paxon to the Lady Calla. The conde oversees a crucial, but economically depressed, region of the kingdom, and Alodia is there to support the union and to secure the conde’s loyalty. But when the much-feared, legendary shadow cats keep interfering with wedding preparations, the already downtrodden people see it as an omen that this marriage should not take place. And so Alodia, seeing her political ambitions for the region circling the drain with the possible dissolution of the conde’s engagement, decides to take matters into her own hands. While the plot for the this little novella is as equally fantastic as the character development, what really drew me to it was the same thing that initially kept me away – Alodia. What is she really like? There are always two sides to every story, so there has to be more to her story than what we see from Elisa’s perspective, right? And, of course, there is. While Alodia is indeed a pragmatic, practical political animal, duty-drive and insanely tough, she genuinely cares about her subjects and their well-being. She’s a princess, and being a princess means making certain personal sacrifices. It means acting with a certain level of diplomacy, discretion and decorum at all times. It means thinking and making decisions in terms of “the good of the many” rather than decisions based on emotion, desire or whim. Being so driven and focused, her younger, lazy sister, Elisa, is an enigma to her and an annoyance. Elisa has been handed a divine appointment for greatness and heroism in being the bearer of the godstone, and yet from Alodia’s perspective, Elisa is squandering it. These are, of course, things we already know about Elisa from The Girl of Fire and Thorns as she is a weak, directionless girl in the beginning of the story. But it’s also interesting to note those glimpses of Elisa through Alodia’s eyes – those qualities and actions that Alodia might consider weakness – that will one day become some of Elisa’s greatest strengths as the Queen of Joya d’Arena. But despite their differences it is clear that in her way, Alodia truly does care about Elisa and that there are things about Elisa she does appreciate. They are two extremely different people, both with qualities the other could learn from. So do I like Alodia now? I understand her better and appreciate her more. Overall, I should haven’t waited so long to read The Shadow Cats. While not a necessary piece of the overall series, it provides a much deeper insight into Alodia’s character — and through her eyes, Elisa’s character as well — while also demonstrating how much Alodia’s example has impacted Elisa’s development in her roles both as queen and bearer. Definitely not a huge fan of Elisa’s sister, but it’s interesting how in this short story you became, if not a fan, someone who respects her leadership abilities. What is also really amazing, and is something that this author does amazingly well, is how greatness comes in so many forms. Elisa, her sister, Hector – and all the secondary characters who help Elisa all embody some type of greatness. It’s a theme in the series I think – how all people, despite their weaknesses or despite us not understanding them, are great in some way or are capable of it. This sounds like a wonderful way of getting to know Elisa from someone else’s perspective!! And to find out how her sister really thinks and feels. This. ↑↑↑ Yes, you summed it up so eloquently. There definitely is that theme running through the series. Good grief, Rae Carson is seriously amazing. <– fangirly moment. I’m not sure Alodia appreciated her as much as recognized the political potential in Elisa? At least that’s the way I saw it. lol I did like her relationship with Lord Zito however. Alodia doesn’t let hardly anyone in, not even her sister, but she truly cares for Zito. And that was a rather redeeming quality for a character I previously thought cold and unfeeling.